Just weeks after Twitter announced that it would be stepping up its efforts to hide and report harassment and abuse, Instagram says it’s also launching a new tool to give users more controls over the comments on the photos and videos they post. Instagram announced two new features meant to give users more control over their accounts, and what they see from others: the ability to turn off commenting altogether on individual posts, and — for private accounts — the authority to remove followers. Starting in a few weeks there will be a way to disable comments on any posts, a feature that was previously only available for a small number of accounts, Instagram co-founder and CEO Kevin Systrom writes in a blog post. 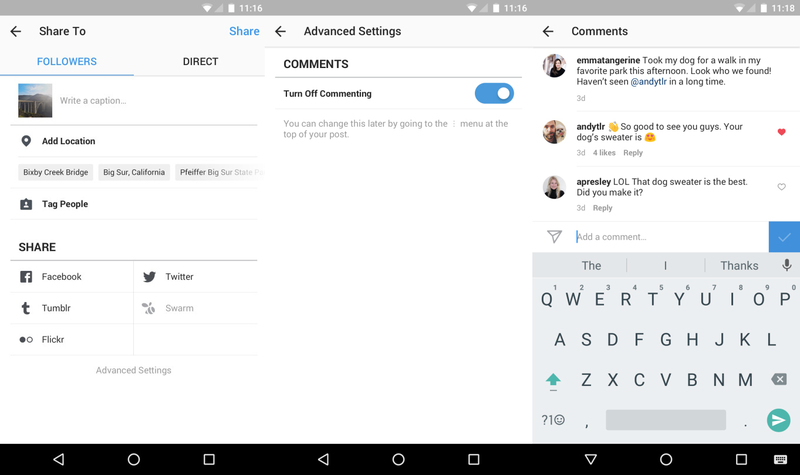 To turn off comments users will tap “Advanced Settings” before posting content, and then select, “Turn Off Commenting.” If you want to turn comments back on, you can tap the “…” menu any time. And in a way to show a bit more support for those positive comments, Instagram is also adding the ability to like comments by tapping a heart icon next to any comment. “Liking lets you show support and encourages positivity throughout the community,” Systrom says. Users who have set their accounts to “Private” will now also be able to remove followers they have already accepted, something that wasn’t possible before without blocking that user. Anyone you remove from your list of approved followers won’t be notified. To help those who may be struggling in the community, Instagram is also adding anonymous reporting for self-injury posts. If you report a friend who may be thinking about hurting themselves, Instagram will connect your friend to organizations that offer help. These updates are just the beginning of the company’s efforts to improve the community, Systrom adds.